The name Barnett is synonymous with quality and performance in the world of hunting crossbows and the Barnett Wildcat C5 is one of Barnett's most popular entry level crossbows. Barnett’s Wildcat C5 bow is one that is steeped in bow making tradition. With its sleek, low profile design, this exceptional bow is patterned after the best selling crossbow of all time. This bow offers the features set and power of an expensive crossbow, with a price tag of around $400. The Wildcat is perfect for smaller stature hunters or those that prefer a lighter, more compact crossbow. The Wildcat is perfect for individuals that are 5’ 2” or taller as these hunters will have the easiest time cocking the bow. The draw weight for this bow is on the lighter side at, 150 pounds. If you are not familiar with draw weight, lower draw weights require less effort to draw the crossbow string than higher draw weight bows. Although it has a compact design, the Barnett Wildcat still maintains excellent power and speed, firing arrows at an impressive 320 feet per second (“FPS”). This crossbow’s speed and power is a result of its quad limb assembly and high energy, which result in the high FPS. The Barnett Wildcat C5 is built for both comfort and performance. The speed of this crossbow is an impressive 320 FPS. The Wildcat’s stock is comparable to Barnett’s higher end models, and is manufactured with Barnett’s Gas Assisted Molding (“GAM”) system. This manufacturing design causes the stock material to become compressed and helps reduce the mass weight of the crossbow because it is hollow. Another great feature of the Barnett Wildcat is the cheek piece, which is ample and well aligned. Some hunters may not put this high on their list of priorities, but this feature greatly adds to the comfort and stability of the bow. Similarly, the foregrip is big and solid adding to the comfort and stability of the bow. The Barnett Wildcat C5 includes an MIM trigger. The Metal Injected Mold (“MIM”) trigger permits tight quality tolerance due to its metal injected molding. Also, the Anti Dry Fire (“ADF”) Trigger is designed to keep crossbow shooters from firing the crossbow without an arrow loaded. Barnett's patented ADF trigger is created with an extra safety bar that remains stationary until the bolt is correctly loaded. At that point the crossbow user can remove the safety and fire. The wildcat works with a crank and is designed with an optional crank attachment built in for simple installation. To install the crank remove the cheek piece. Installation of the crank cocking device is simple thanks to the integrated bushings in the stock. Crossbow fishing is akin to handbow fishing in that a line must be attached to the bolt to facilitate it's retrieval - hopefully with a fish attached from time to time. Most fishing crossbows come pre-equipped with a fishing reel attached (to the underneath), making for fairly easy retrieval. Special bolts are required as well. 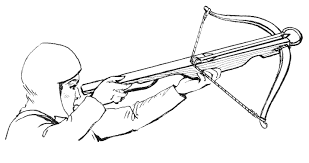 Some fishing crossbows also come with a mounted scope, though you may find this an impractical addition. Spotting a fish moving underwater through a small scope is quite cumbersome in most instances - you may prefer the freedom of using the crossbow's sights to zero in on your watery target. Most crossbow fishermen practice their sport from a boat, as this is really the only practical way to reach your quarry. Be sure to check your states' regulations for crossbow fishing, as some states do not allow it. A special license will also probably be required. Good luck in your search for fishing crossbows. More and more hunters are discovering the fun and excitement of hunting with crossbows. Whether you're a long-time bow, rifle, or black-powder hunter, or have never even been in the field before, don't overlook the thrill that crossbow hunting can provide! Some compound and recurve handbow hunters frown on the use of crossbows as a hunting weapon, feeling it's "too easy" - but that's just one of several misconceptions surrounding this ancient weapon. As you'll discover, crossbows can be just as challenging as a hand bow or rifle when it comes to bringing down both small and big game. There are many styles of crossbows available today. Some are designed merely for target practice, while others are powerful enough to bring down deer and even larger game. But whether you're rabbit or deer hunting, there's a crossbow available for your hunting style - and your budget. Quality hunting crossbows can be had for as little as $120, and you can easily shell out $600 or more for premium crossbows. At first blush you may be tempted to think that compound crossbows are the way to go - but wait! Only recurve crossbows provide the near-silent hunting that crossbows beg to be used for. Compound crossbows are comparatively loud next to a recurve - and they're generally alot more expensive as well. Pistol crossbows are also touched upon within this site, although they have such a low draw strength that they aren't practical for most hunting applications. Another use for the crossbow is crossbow fishing. A small segment of the population literally hunt for fish from a boat using a specially configured crossbow that allows for retrieval of the bolt, presumably with a fish still attached. You'll find that there are myriad applications for crossbows, bound to bring you hours of target shooting and hunting pleasure! This website is designed to answer all your questions related to crossbows and accessories, crossbow hunting, and more - so spend a few minutes prowling around this informative website, and enjoy! Every year it's the same thing. Family and friends all want to know what to buy me for Christmas. I dread it all December long, because I never know what to ask for. After all - if I need it, I just buy it for myself. And if I want it...I just buy it for myself. Who wants to wait to unwrap something that you could have gone out and purchased for yourself? I believe that many of us suffer from "can't see the trees for the forest" syndrome when it comes to our own needs. To me a Christmas gift should be something you never thought about buying yourself. Some of the best gifts I've ever gotten were things that somebody else, using powerful observation skills, realized I truly needed. Whether it was a first aid kit or a jack for my car, someone was astute enough to see a need that even I didn't recognize. Those items make great gifts - not just because they truly are needed, but also because they say, loud and clear, "I care about you enough to think about your needs." Of course, there's nothing wrong with the practical, common-sense gifts either - they certainly have their place. Take me, for instance. A great, no-brainer gift for me any Christmas season is a crossbow. There are so many sizes, shapes, brands, and colors to choose from! There's quad-limb crossbows, recurve crossbows, compound crossbows, medieval crossbows, and pistol crossbows from Horton, Barnett, Tenpoint, Excalibur, PSE, and gads of other manufacturers. With so many styles to choose from, how can you go wrong? And if that isn't enough, crossbow accessories make great stocking stuffers! There's crossbow targets, bolts, replacement strings, bolts, scopes, bolts, string wax, crossbow cases...and oh, yeah - bolts. Carbon and aluminum. Yummy. So I guess what I'm trying to say is, if you see a definite gaping hole in my life that only a particular possession can fill, kudos to you for recognizing and filling it come Christmas day. But if you don't have the time (or simply don't care), just know that you'll never miss if you buy me a new crossbow. And really, who wouldn't want a new crossbow every Christmas? Especially with all those walls just waiting for a good adorning. Legolas asked me for an autograph.